By TIM GOOD | Good Design, Deep River, Conn. In the last 15 years, even small municipalities have had to take big steps to combat the threat of pollution from stormwater runoff. The push came with the U.S. Environmental Protection Agency National Pollution Discharge Elimination System Phase 2 Rules, promulgated in 1999. The rules address the problem of polluted runoff, which continues to be a leading cause of degraded water quality in our nation’s lakes, streams, beaches and waterways. They require communities to adopt stormwater best management practices to improve their water quality. Recently, the EPA announced that it is deferring further rulemaking as a next step to Phase 2, instead focusing on actions that can help communities address challenges at the local level. The idea is to give localities more flexibility to build stormwater programs and get them closer to complying with the goals of the Clean Water Act. During this 15-year water-quality effort, hundreds of engineers and communities in the U.S. successfully employed simple devices made by Best Management Products Inc., of Lyme, Conn., to curtail stormwater pollution. It all starts with a great plan. Eric Sanford, PE, CPSWQ, principal and director of municipal services for DDC Engineers Inc. in Myrtle Beach, S.C., has been using BMP’s Snout water quality hoods for more than 10 years. As primary municipal engineer for cities in northeastern South Carolina, including Myrtle Beach, North Myrtle Beach and Surfside Beach, Sanford is aware that keeping the beaches clean is a big driver for DDC’s stormwater designs. “We know people visit the beach to have a good time. Part of that means folks are doing a lot of eating, drinking and shopping at our famous waterfront venues, all while walking from place to place. With that activity comes trash and debris. Making sure it doesn’t flow to our waterways and the beach is a crucial part of our stormwater planning,” Sanford said. Snout hoods are installed in stormwater structures with a deep sump, which is extra depth beneath the bottom of the pipe that allows for the capture of solids that will sink and settle out of the runoff. 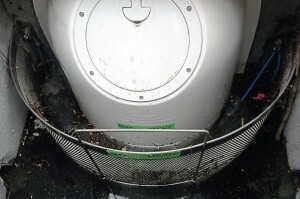 The hoods, whose bottom edge is typically a foot or more beneath the pipe invert, then create a baffle that allows floatable debris to be skimmed off the surface, preventing pollution from exiting the structure and causing problems downstream. The cars that bring tourists to the beaches also drop oils and other hydrocarbons that are targeted for removal. Sanford is using BMP’s Bio-Skirts with the hoods to capture this oil before it gets to the waterways. “We have been employing Bio-Skirts in hot spots where there is a lot of traffic or parking facilities. Oil sheens are not what people want to see in the water, and we’ve added this extra measure of quality control. It’s making an impact,” Sanford added. DDC has utilized nearly 1,000 Snouts and over 300 Bio-Skirts in its designs. A review in 2013 estimated that the hundreds of Snout structures in Myrtle Beach are keeping more than half a million pounds of trash and debris out of the water on an annual basis. On a recent project in North Myrtle Beach, Sanford used BMP’s Snouts, Bio-Skirts and stainless trash screens to tackle downtown flooding and improve water quality. These goals are often at odds with each other. Fortunately, BMP makes Snouts up to 96 inches wide that can handle flows in excess of 100 cubic feet per second, while still allowing for water quality control. Two of these large hoods were needed for the Main Street outfall. Residents and visitors also notice the city’s stormwater quality efforts. “They see less debris and trash on the beach because it’s not allowed to reach the outfall. The city performs street sweeping, but no matter how much we do to keep the litter out of the catch basins, cups, bottles and other items that people throw away end up in the drains. 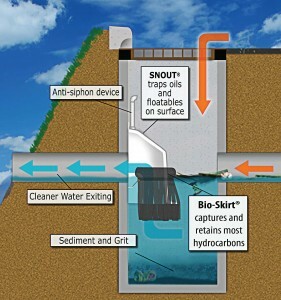 That’s why we use the Snout and Bio-Skirts in our inlets, especially around Main Street, which is a busy area where the possibility of pollutant loading is a lot higher,” he added. Maintenance, of course, is key to long-term success: a fact that Jennifer Rauhofer, PE, president of Stormwater Maintenance and Consulting in Hunt Valley, Md., knows well. Her firm maintains hundreds of structures with Snouts in the Mid-Atlantic region. She often hears from her service crews that these structures keep underground stormwater facilities much cleaner, prolonging their service life. 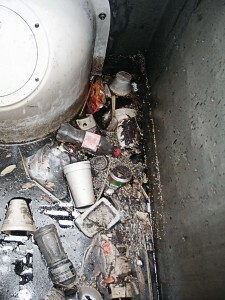 “No matter what pollutants you are trying to reduce, be they nutrients, oils or dissolved metals — anything that requires infiltration, filtration or phytoremediation — you need to prevent that high resolution treatment step from being clogged with trash and debris,” said T. J. Mullen, president and co-founder of BMP Inc. “Whether it’s a treatment train that combines low impact development concepts to reduce runoff and structural elements to tackle the trash and debris; the creative engineer who designs a sustainable system; the municipality that implements the design; or the crew that follows through with a conscientious maintenance program, it’s a team effort.” BMP looks at the company as part of that team. “Many of our customers want us on the team. We have more than 65,000 installations in North America, and we get more inquiries and projects coming our way every day,” said Mullen. BMP has a long-standing offer for any municipality that has not tried a Snout before — it will give you the first one for free, no strings attached. Find out more about its “Free and Clear” program on the company website: It’s an offer that is hard to refuse and that is sure to keep BMP busy.